The RBA has released a research paper assessing the impact of restrictive zoning rules on Australian house prices, estimating that they represent a punitive tax on home buyers, especially in Sydney and Melbourne. If housing demand continues to grow, as seems likely, then existing zoning restrictions will bind more tightly and place continuing upward pressure on housing prices. For all of those currently arguing that population growth does not cause house price rises, here’s your bitter pill. It is hard to escape the conclusion that we need to address the supply side if we are to avoid ever-rising housing costs relative to our incomes and to avoid the attendant incentive to borrow that is created by rising housing prices”. Then there is the current favourite of the high immigration set, including [The RBA’s Luci] Ellis: we need huge, congested cities to give our economy dynamism, promote innovation and boost productivity. We have seen ridiculously high population growth rates in Melbourne and Sydney, but sadly for Ellis the data on productivity does not support the thesis. Given the RBA knows that the housing supply system is busted, and will most certainly remain that way, and it’s monetary policy settings are consistently being twisted around managing this market failure, it’s time the Bank joined the Grattan Institute and MB in canvassing the only pragmatic solution: reducing the demand pouring into the broken supply-side. For the love of God, please save us from the 19th century abomination of the intersecting straight lines of the Supply and Demand scriptures. If we have to have Steampunk, then let it just be leather caps and flying goggles. Have to agree with you DM, supply and demand is predicated on Homo economicus rational – agent – models. The need to simplify complexity and worship before numerology without having to look out the window with but utilize bias optics does not reveal reality – it just denotes the users preferences e.g. corner stone to neoliberalism i.e. Cahuc, Carcillo and Zylberberg w/ the dreaded equilibrium belief. disheveled… and some people are confused why both political legacy party’s are so alike, EP the other day commented along such lines…..
Yeah a two dimensional graph of a 4 dimensional problem…..’bout as useful as a chocolate tea pot. Perhaps the NIMBY’s in the hard right liberal electorates of Northern Sydney and South East Melbourne could ask why there is a need for 50 000 apartments a year rather than trying to stop them. Perhaps some of Tony Abbotts lot benefitting enough from the FIRE industry ponzi don’t actually want FIRE near them. What are the Australians learning from the New Zealanders ? ‘My home country New Zealand is the global leader in dealing with political impediments, so that the supply of new affordable housing is restored. The public conversation to restore affordable housing began in earnest early 2005, with the release of the 1st Annual Demographia International Housing Affordability Survey . We are now moving to the implementation phase, with a recent change to a centre – left Labour led reformist government. No? Too bad, because that is the effective tax extracted for the average new house-and-land package in Sydney due to the impact of zoning regulations. … Lets compare Houston, USA and Sydney, Australia. Expressed in local currencies, the median household incomes for both cities were, during 2004 ( in local currencies ) $50,400 and $57,100, with median house prices of $138,350 and $505,000 respectively. So it would take 8.8 years of median household income for a Sydneyite to purchase a median priced home, but just 2.7 years of median household income for an Houstonian. Politicians are gradually edging closer to acknowledging the true causes and consequences of Britain’s dysfunctional housing sector. Prime Minister Theresa May took the next step this week, setting out clearly the stakes. In 1997, the average home cost 3.5 times the average wage. By 2010, that ratio had more than doubled. Demographia’s annual Housing Affordability Survey, which calculates median house prices divided by median incomes by region, suggests a ratio of 8.5 in London, 6.8 in Cambridge, 6.4 in Oxford and 7 in Bournemouth. Price signals are screaming “build more homes” in these areas. … Where housing is concerned, the weight of evidence suggests government is the problem and not the solution. If we stopped artificially constraining developable land where people actually want to live, and gave local authorities and residents the chance to face the financial trade-offs associated with development, supply would be much more responsive to demand. The intellectual debate on this is won. Eventually, our politicians will catch up. There has been a continued downturn in the number of residential building consents at the beginning of this year. In December and January, the amount of residential consents fell sharply. The infrastructure planning is atrocious too. When a steam train went at 200 km/h for the first time, they should have reserved a 22 metre wide corridor from MEL to SYD that is straight enough to allow 200 km/h speeds. Hitler’s autobahns were overkill in the 1930s but 50 years later, people drove cars on them at 250 km/h. The land for EastLink was reserved 40 years in advance. We should have built enough water reserves to allow everyone to be able to use intensely fast flowing water devices! This true! Every great civilisation has been marked by high flow shower heads. 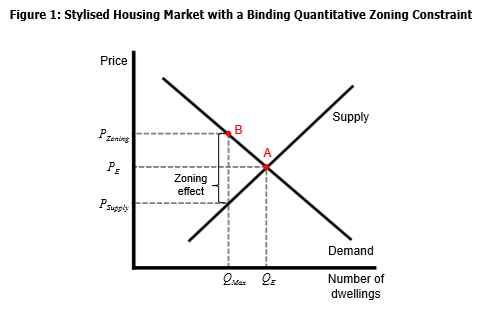 Zoning may be a factor that amplifies the effect of speculative demand, but it’s speculation that’s the real problem. Sydney’s market has plateaued, not because land supply has suddenly improved, but because lending has tightened just a little (and China is controlling capital outflows a little more carefully). It’s both,…esp for free standing houses. R4 zoning (apartments). A guy can make 3 time his money when the zoning changes, so there will always be speculators. Exactly. 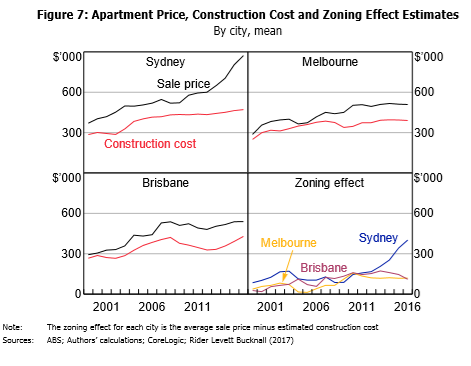 That is why densifying can never result in the construction of affordable housing – because the land price change in response to the change in zoning. 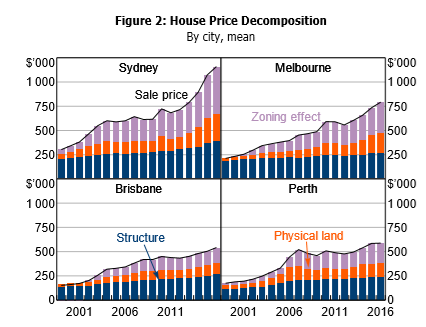 With pretty much every state in Australia heavily restricting greenfield land release no competitive land market exists in Australia and for this reason densifying will never result in cheap housing. Only if you are obsessed with price. (As 99% of people are). Restrictive zoning that does not match immigration causes Aussies to miss-out on independent housing. THAT IS THE REAL PROBLEM. Speculation does not cause more Aussies to miss-out, unless the speculator keeps the housing vacant and off the market. Speculators take advantage of the real problem that is caused by restrictive zoning that does not match immigration. Does a fireman try to put out the smoke? Smoke kills more people than fire. Is the smoke the real problem? “Speculation does not cause more Aussies to miss-out, unless the speculator keeps the housing vacant and off the market. I thought it was clear that this is in fact part of the problem? Cameron Murray does a decent job of explaining the perversion of Value Capture. So it effectively becomes a transfer of wealth from tax payers to property holders, and contributes to increased property speculation. Historically, this was handled with windfall taxes to recoup the cost of building the infrastructure. I posted an anecdote about a housing affordability discussion had at my last ALP branch meeting and how one fellow (in his 70s) brought up how he got his home block in Ermo via a land ballot,…first attempt to “win” a block at Beecroft failed,…talk about a sliding door moment! Anyway after a long ramble,…I asked what’s stopping the Govie from reintroducing a ballot system for lower income earning Citizens using Govie acquired or owned land,…like we used to. Why not land acquisition bonds like infrastructure ones, that aquire pre Zoned rural and semi rural land for affordable housing. A following informed answer, depressed me. @ Ermo, in NSW what land can be built on is determined by the NSW Govt or in the case of Sydney, by the Greater Sydney Commission. Under the Environmental Planning and Assessment Act 1979 (EPAA) the Greater Sydney Commission produces a strategic plan ‘A Plan for Growing Sydney’ and and ‘District Plans’ for each district within its jurisdiction. When Councils within the Greater Sydney Region have to renew their ‘Local Environmental Plans’ (LEPs)(generally every 3-5 years) the LEPs must give effect to the relevant District Plan (EPAA sub-s 75AI(2)-(4)). What does this all mean? It’s the LEPs that delineate zonings to particular parcels of land within Council boundaries, and of course it’s zoning which determines what can be built and where. Basically the NSW Govt and the Greater Sydney Commission have an iron fisted grip on zoning as the NSW Govt and the Greater Sydney Commission have the say so on zonings proposed in LEPs submitted by Councils to the NSW Govt and the Greater Sydney Commission for their approval (generally all lands within Council boundaries is zoned for a particular use). As to greenfield land releases (which represents the only option of providing land on the cheap) the NSW Govt controls this completely. In the case of Syndey most areas where greenfield land exists (greenfield land being land that is rural/semi rural) such lands are covered by the NSW Government’s State Environmental Planning Policy (Sydney Region Growth Centres) 2006 (NSW) (‘Growth Centres SEPP’) which is an ‘Environmental Planning Instrument’ created under the EPAA. The Growth Centres SEPP is the mechanism under which greenfield land within the Sydney region is ‘released’. Under clause 276 of the Environmental Planning and Assessment Regulation 2000 (‘EPAR’), the Minister may declare any precinct or part of a precinct in the Growth Centres SEPP to be ‘released’ for urban development. When an area has been declared ‘released’, an amendment is made to the Growth Centres SEPP which details the area that has been released and any amendments to the relevant Precinct Plan. Typically when land is declared to be released in this way it results in a rezoning by the Minister for Planning. For example, on 23 October 2009 the Minister announced pockets of the North West Growth Centre as being released for urban development. On 5 April 2013 State Environmental Planning Policy (Sydney Region Growth Centres) Amendment (The Hills Growth Centre Precincts) 2013 (NSW) (‘Hills SEPP’) was enacted to specify the planning controls that would apply to the release area in accordance with the Precinct Plan. When the Hills SEPP was enacted this had the effect of, amongst other things rezoning the Box Hill and Box Hill Industrial Precincts from RU2 Rural Landscape (a form of zoning provided for in the Standard Instrument (Local Environmental Plans) Order 2006 (NSW) (‘SIO’) to a variety of urban development zones to allow development to occur in the manner envisaged by the Growth Centres SEPP for the Box Hill and Box Hill Industrial Precincts. In the case of the Box Hill and Box Hill Industrial Precinct land releases, it is notable that it took approximately 4 years from when the land was released until the planning process for the release was completed with the enactment of the Hills SEPP in 2013 which allowed building to begin. In relation to greenfield land release outside the Sydney region, land can be rezoned by a Council but only by making a new LEP or by amending an existing LEP (both of which are subject to the lengthy ‘gateway determination’ process by the Minister for Planning which can be expected to take at least 12 months or more). For example, in the case of West Dapto on the NSW south coast it took 6 years from the time the NSW government identified a need for rezoning in West Dapto (to accommodate projected population growth), until the time land was first rezoned (stages 1 and 2). The NSW Govt maintains an iron fisted grip on land release because even though developers are required to contribute to infrastructure provision the NSW Govt typically still has to stump up 50% of the cost of greenfield infrastructure provision (http://www.planning.nsw.gov.au/Policy-and-Legislation/~/media/096ACD7A95C14CFDAC4D74EE079608F2.ashx). As LVO has said many times, fixing infrastructure financing is a good place to start. NZ seem to be moving in this direction by seeking to introduce infrastructure bond financing. Yes. Just because land is re-zoned doesn’t mean that whoever owns that land is going to bring it into the newly allowed use. If re-zoned land happens to be owned by a developer they may choose to landbank it or if it’s owned by a private individual they may have their own reasons as to why they’d prefer not to sell to a developer in order for the re-zoning to result in the newly allowed use. This is the problem with ‘zoning’ and especially the kind of drip-fed selective zoning we have in NSW. In order for there to be cheap land available for building there has to be enough land zoned for that purpose. Anything in NSW zoned with one of the rural classifications can’t be turned over to housing without a rezoning to another use. In 1922 and all up until the 1940s there was no such thing as zoning under the Local Government Act 1919 which was the principal planning legislation in NSW at that time. Therefore any land was open to development without the strictures of ‘zoning’ to prevent it. Thus at that time land could be subdivided into building lots despite such lots having not much if any services. Subdividers would usually sell allotments with only a leveled and unsealed road, with it being the responsibility for providing water, sewerage, drainage, electricity and telephone services of councils or relevant public authorities. Given the low costs associated with subdivision (not having to provide much if any services) large tracts of land were subdivided in towns and cities well in advance of anticipated demand. Households in areas where no services were provided relied on rainwater tanks for their drinking water and on septic tanks or night soil collection for disposal of sewerage. Services were only likely to be provided once a large enough proportion of houses were built on newly subdivided lots and as and when they could be afforded by the NSW government which was usually funded by government debt. It was the freedom to subdivide and the freedom to essentially build whatever one wanted at that time which kept a lid on land prices. Like Phil, LVO and many others have pointed out ONLY a competitive land market can deliver cheap land. In order for a competitive land market to exist in NSW basically any land currently zoned RURAL under the SIO should be ‘unzoned’ with the result that there would be freedom to subdivide and freedom to build pretty much anything anywhere subject to some easily understandable minimum standards (for example lot sizes and minimum thoroughfare widths). Combined with an adequate infrastructure funding mechanism like exists in Texas the housing affordability problem would disappear. The job of government planners should be planning major trunk infrastructure and setting aside land for that purpose rather than micromanaging every parcel of land in NSW through zoning. I can’t follow all of the details, but, I think everything you have said would pretty much be true in every state and country throughout the world. What makes Australia different from other places is not its land release and development processes, but rather its total lack of infrastructure planning and astronomically high immigration levels. By the way – did anyone see the commentary on this in today’s SMH? Their article supports the idea of high density development on the Northern Beaches, where there is zero public transport. Having a nine storey apartment block next to your suburban house is described as “acceptable”. What was once called decentralisation is now vilified as a “scattered approach to housing Australia’s growing population” (which is the only mention of population growth in the whole article). It’s not a lack of insfrastructure planning as such but more a lack of funding. the reason that the NSW Government moved towards the current system is because up until the 1980s the NSW Government was incurring not insignificant amounts of debt to fund infrastructure to support development. However in the neoliberal era where government debt was frowned upon the NSW govt decided that one way it could reduce its debt was to pursue urban consolidation and thus save on infrastructure costs by forcing most new development into areas with existing infrastructure. Although as pointed out by LVO many times only certain categories of infrastructure have ‘spare capacity’ and only up to a certain point. Really one can hardly blame the NSW govt for this given that they raise only about 17% of all tax revenues with the Feds raising about 80%. After WWII the there was a housing crisis in Australia as not enough houses were built due to the effects of the Great Depression and the diversion of resources to WWII. The Feds under the Commonwealth State Housing Agreement provided long term low interest loans to the states to provide housing which allowed much associated infrastructure and housing to be built. In the 70s money from the Feds for that purpose started to dry up. And not surprisingly the NSW govt sought to limit its expenditure. It always all about the money. if there’s an adequate mechanism to fund infrastructure it will be planned for. But given the entrenched vertical fiscal imbalance in Australia I don’t expect infrastructure planning to improve especially given the level of corruption and incompetence around infrastructure projects currently on display. Timon, you make very good points. I have to say, Neville Wran and even Bob Carr have to take some of the blame for this. Let me say that I totally agree with Bob Carr about immigration, and it is a tragedy that he was prevented from moving to Federal politics decades earlier (because of the Laurie Brereton corruption scandals). Having said that, Carr really dropped the ball in terms of failing to heed his own departmental advice to buy up land around planned train stations at favourable prices in the late 1990’s and early 2000’s. This has nothing to do with debt or taxes but was simply very poor management. I mention Neville Wran because he sold off vital transport corridors which had been set aside for future public transport projects, which now cannot be built because of his terrible decisions (which, admittedly, won him votes in the short term, but caused terrible harm in the long term). Agree. I suspect that kind of political opportunism is a feature of our political system as MB commenter Stephen Morris has pointed out many times. It’s hard to insulate planning from politics as planning itself is a political process. The corner stone to neoliberalism – is – the “because markets” supply and demand model. Planning, demand, tax rules that encourage speculation and easy debt have all combined to make this Frankenstein. This letter in yesterday’s Age jumped out at me. Notice the difference between wage and house cost. “People seem to have forgotten or were unaware of the pivotal role the banks have played in the out of control prices in the housing market. I bought my first house in 1984 for $59,000 in middle-class Greensborough. At the time, I was earning $26,000 a year. When my partner and I approached the bank for a loan we were told they would only lend us what we could repay with 30 per cent of the primary breadwinners wage, not our combined wage. The banks had a duty of care to the customer to not put them in a perilous position if something went wrong or we chose to start a family. This indirectly linked house prices to wages because if people were limited in what they could borrow this limited their purchasing power, and anything is only worth what people can or will pay for it. A few years later the banks were privatised and they did whatever they could to make money; they started lending vast sums of money to all and sundry. House prices started their crazy upward spiral to cash in on the available funds. Look where that has landed us. Yes, the old lending rules were good in a way. But, you can kind of see why they changed. It could be argued that they discriminated against single people, women, blacks, contract workers and the self-employed, and gave preferential treatment to men, white-collar (and white-skinned) workers, and married couples (including recently divorced or separated couples who had built up equity in their first home and were looking to purchase a second home taking advantage of government-mandated “owner-occupied” interest rates). @yogiman – that is not why they changed though. It changed because of ‘competition’ from deregulation: with non-bank lenders being able to borrow from overseas and bypass the need for taking deposits. It started a downward spiral of loosening standards. Overwhekming capital inflow always results in malinvestment. I’ve had this thought for a while – that zoning rules and regulations are far too tight. Whilst I’m not for one second suggesting we allow residential development next to a toxic dump – I feel that we could be allowing a lot more ‘mixed use’ zoning where commercial and residential are both allowed on the same land title. If you think how much commercial / light industrial zoning exists in close proximity to major public transport links in our major capitals – there would be much to benefit from more mixed zoning being allowed. Why can’t you have an automotive workshop or small warehouse on the ground floor, with 6-8 floors of apartments above? There is absolutely no reason we couldn’t do this except for silly zoning restrictions that significantly hamper a cities ability to keep pace with housing demand through creating new supply. There are whole public transport corridors in our capital cities that could house thousands more people easily if mixed use zoning was relaxed and made more widely available. This exists and is extremely common. If by commercial you mean industrial (which i suspect you do) then you obviously have no real idea of the kinds of impacts industrial development has on residential land use. Literally no developed city in the world mixes industrial and residential. Not one. Hang on, aren’t all prices determined in fiat currency which is an ever expanding ponzi scheme? Cui bono….anyone else notice how the RBA avoided the topic of just who benefits from these restrictive Urban Planning rules…..being part of the Game-of-Mates brigade their already on thin ice even broaching the topic of Planning gains, but actual naming and shaming , goodness no after all we are gentlemen and there are some things a gentleman will never reveal. I we have such “restrictive zoning laws” why the south east coast os Straya has more cranes than the whole of North America? what’s difficult to understand, supply itself is not inadequate rather that the supply that had been zoned was withheld from sale for many years until the desired price point was reached. This sort of collusive behaviour (between major landbankers) is only possible when an individual is restricted from gaining these building/zoning rights for themselves. This does not mean that we need twice as much land zoned residential but rather that we simply need to have transparent and accessible processes by which individuals and groups can achieve this zoning gain for themselves if and when they need it. The planning proposal process through which land is rezoned is always the subject of public notification and submissions and requires the agreement of both the local council and the state department. Any and all information relating to the process can be obtained with a GIPA form, if it’s not otherwise already freely available on the governments tracking website. Seems pretty transparent to me. Delays are a major reason that individuals do not undertake these tasks for themselves, another is assigning tasks that are impossible for the individual / small group to adequately undertake (road building / sewer systems / water infrastructure) this is where something like a system of Texas style MUNI bonds are an essential element to the fast and efficient Rural to Residential land use transformation. I don’t think it would be appropriate to allow people to seek to rezone individual plots of land, if that’s what you are trying to say? It would be a clusterf*** of incompatible mixed uses and the burden on infrastructure we have now would be grossly exacerbated. It’s possible for land owners who own vast swathes of land to request rezoning. I don’t think they should be allowed to rezone at will though. Look to land prices. Even though there’s a large number of apartments being constructed – how can they be priced cheaply given their cost structure? As highlighted by Bob Birrell and David McCloskey in http://www.botanybay.nsw.gov.au/files/sharedassets/public/documents/planning-and-development/unit-mix/sydney-melbourne-housing-report-no-2-no-end-in-sight-6-mar-2016-std.pdf average land cost per unit is 200k with construction cost on average about 200K. If the average wage is about 82K and in accordance with Demographia surveys affordability cuts out at 3x income these apartments can’t really add to affordable supply due to their cost structure as those apartments can’t be sold for less than 400K. The land price reflects the planning induced scarcity of land with building permission. Zoning happens to be the mechanism by which scarcity is created. If we have such “restrictive zoning laws” why the south east coast os Straya has more cranes than the whole of North America? Because eventually prices get so high that palms get greased. Today’s high prices are prima facie evidence of restrictive zoning laws. The difference is price between housing zoned land and non housing zoned adjacent land is prima facie evidence of severe shortage caused by restrictive zoning laws. why the south east coast os Straya has more cranes than the whole of North America? Because restrictive zoning laws force highrise upon us in Australia, whereas North America allows more decent housing to be built. So when someone says that we have a broken planning system do they actually mean that there is a land zone somewhere that they wished was zoned something else? This whole thing just seems like a bit of propaganda to push the relevant State Departments to rezone large swathes of valuable land for glorious, sky high RFB’s. The issue is that as zoning is restricted, even dog boxes 45km from the CBD is over 600k in Sydney. If all zoning restriction is removed it’ll be a lot cheaper. Looking out the window of the train as I head to Central, most of the zones from Straitfield to Redfern are low density, which is a very inefficient way develop a city. But if you don’t have zoning laws then literally all that will be available will be dog boxes. And they probably won’t even be cheaper, given the immigration thing MB bangs on about. This all sounds like a smoke screen to me. Take of in a plane from Sydney airport, heading west, and look out the window,…easily less than 20% of the whole of Sydney basin is developed,…open underutilized land everywhere. You don’t notice how much, just driving around, because they fill in along all the main roads. Sydney could have a several million people more,….all living on affordable 1/4 care blocks if we released the land,…and dialed back immigration,…just a little. @Ermington, Completely false. Land use tables are freely available in every local government locality’s Local Environmental Plan. You can google it. Large swathes of undeveloped land there are not. And we certainly could not increase density without massive concurrent investments in all kinds of infrastructure. Millions more people would require hundreds of billions of dollars of investment in infrastructure to maintain living standards and a functional city. Once land is rezoned to urban residential uses or upgraded to a higher order urban use, it should be subject to a state-wide Betterment Tax or Improvement Tax. They operated for years on the outskirts of Sydney until abolished in the 70’s. These taxes exist in Perth and the Gold Coast as Improvement taxes to recoup the cost of new infrastructure. 30% of the cost of the Sydney Harbour Bridge North Shore suburbs was recovered via a betterment tax on North Shore suburbs. Ditto for properties benefiting from the new Gold Coast light rail project. The Henry Report addresses the issue of reintroducing Betterment Tax for urban rezonings but dismisses it in favour of a broad-based land tax. No surprise there. But we know they have worked in the past.and we know developers and land speculators hate them, so maybe its time to bring back a Greater Sydney or Melbourne Betterment tax. Fast tracking the Badgerys Creek airport via a tax on land improvement on the rail corridor would a good project to trial its re-introduction. The idea of having planning restrictions is to develop parcels of land in blocks. This means that services such as schools, public transport parkland etc can be developed along with the subdivisions. Having an ad hoc do as you want approach to planning means chaos. Scott Morrison would blame planning restrictions because it takes the heat off his own failed policies. Don’t forget he’s a two sided snake of a man, as are all the conservatives, interested in only feathering their own nests. The real cause of this inter generational theft is the the supply and demand of money, negetive gearing and capital gains tax concessions. Seems like th RBA is singing from the same song sheet. Tex, the planners are failing to keep up with population growth. Something needs to change.